How many times have you tried using Office InterOp to manage various custom properties? If you have ever tried it then you will see the article image very appropriate. After spending hours trying to solve a question I finally gave up on Office InterOp and took an easier way out - OpenXML SDK. If you need to start windows update installation remotely or as a scheduled task you will find this very helpful. if we want to run this script for a group of computer only not domain wide ? It was really hard time for me to get the understanding of Delegates in C#. I went through many websites and articles but I found them very clumsy. After going through those sites, I noted down the points in a easy way so here I am sharing that understanding with Experts-Exchange users. As this is my very first article so I was not aware of all these points. I have submitted my article with the specified modifications. Please review it again. 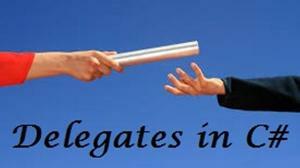 Any method which matches the above delegate type can be assigned to this MyTestDelegate delegate. What do you mean by "matches"? To call those methods through delegate, we have to use Invloke() method of that delegate. Don't forget about the async/await functionality of .NET! Calculating holidays and working days is a function that is often needed yet it is not one found within the Framework. This article presents one approach to building a working-day calculator for use in .NET. Very well written, and I can see how this can be very useful. Voted Yes. Great article, upvoted. See also the PHP versions in Practical Application #9, here. When a custom control is placed on the toolbox, if it is a professionally made control, it usually has a really nice icon associated with it instead of the default custom control icon that Visual Studio inserts when no icon is available. When you build your own custom control, you can add an icon for the control and embed it in your component's DLL assembly so that it is shown on the toolbox whenever someone adds your control. you need to follow below steps to add icon in your custom control. Create your icon and save it as a bmp file (16x16), named as shown below. Step 2: Add in Project and Change Build Action Properties to "Embedded Resources". Stpe 3: Add ToolboxBitmap line in your class file as per screenshot. Step 4 : Compile your Project as "Class Library". Step 5: Add this control in Different Solution Project Toolbox using choose items and icon will display like below ( In Same Project icon can not display). Object Oriented Programming in 500 words or less. 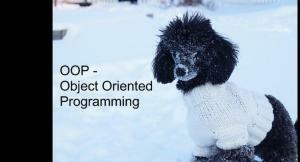 Ever wonder how to "do" object oriented programming (OOP)? Quite right Doug. Thanks for your thoughts! 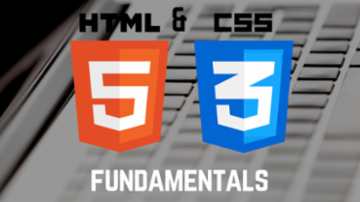 With this one you're reading, I'm starting a series of articles focused on creating and manipulating graphics in .Net using GDI+ library starting at the most basic level of knowledge in this area. I'll post all the source code in Visual Basic.net, as it is my preferred language, although the code would look much similar and is really easy to translate from VB.net to C# using one of the many excellent online translators (for example, this one). GDI+ was introduced by Microsoft in Windows XP as an improvement and a replacement of GDI. GDI (Graphics Device Interface) was present in all prior versions of Windows and was a core OS component responsible for representing graphical objects, as well as transmitting them to output devices, such as monitors and printers. Note that GDI was not responsible for drawing windows, menus, and other Windows OS core graphical objects (those features are in the user subsystem). As said, Windows XP replaced the old GDI libraries with GDI+, which improved GDI by adding new features and optimizing existing features. MSDN defines GDI+ as "the portion of the Windows XP operating system or Windows Server 2003 operating system that provides two-dimensional vector graphics, imaging, and typography". 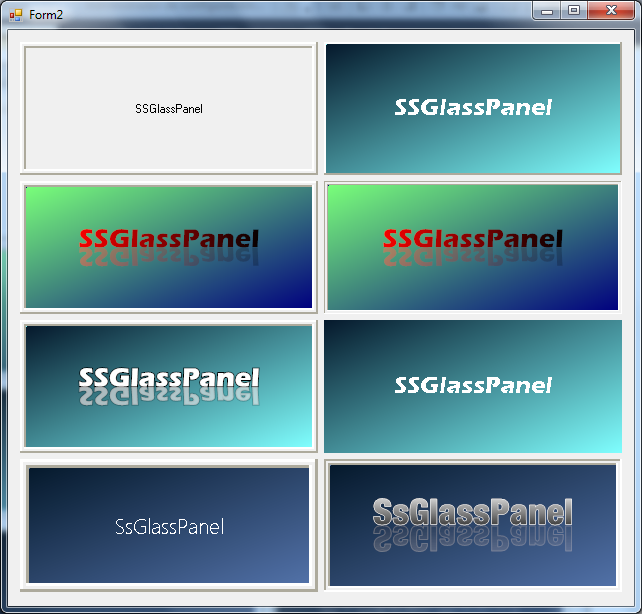 The .Net Framework graphics system uses GDI+ through the System.Drawing namespace. Well... probably you have noticed that I have not much time to write articles. But I feel specially proud of my GlassLabel control article, as it has been awarded with Community Pick and it has more than 3000 views until now. In the mentioned article, I suggested several issues for further programming. The most important, I think, the ability to align the text anywhere on the control (as the original GlassLabel control allowed only centering the text either horizontally or vertically). But... recently I was reviewing some *very* old VB6 programs that I made... well... 18 or 20 years ago. I noticed that, in most of them, I used the old Sheridan 3D Panel (SSPanel). Do you remember? Oh, how many times in the past I was looking for threed32.ocx (as it was not installed in the standard VB6 installation) and registering it with regsvr32! Well, in more recent times it seems that we all have declined that old-fashioned 3D look, now all must be plain and simple, don't you think so? But the SSPanel control had something... I don't know, but... special. Looks good! Voted 'yes' above. Great work, Roland. Thank you very much, tigermatt!! YaLanCha - Yet Another LAN Chat Application? I needed a simple person-to-person chat system for use only in my home network behind my router firewall. My only requirements were that the system not require a central server and that it not require any kind of installation other than "copy and run". My intended use of this chat system would entail only simple text conversations with the ability to send a link to a web site. I did not need or want any fancier features such as chat rooms, emoticons, file transfers, voice chats, group broadcasts, or online statuses. I just wanted a system that was always on and was ready to send/receive text messages to any other computer in the household. A quick search of the web yielded a huge number of possibilities; many of them free and quite capable. Ultimately, though, I found myself not wanting a bloated chat system that I didn't really trust not to be infected with a virus or malware. This is perfect...can u please tell me why it is detecting only two computers on my network? Thanks for posting the whole code along with logic well explained. I have a strange requirement, but I dare ask - I want to use this chatting feature be available from within Excel, i.e. whenever Excel is open, it should work as Listener and Server and be used for opening chat conversations with people on my network, provided they have the same program running in their active Excel application (possibly by putting this code inside PEROSNAL.XLSB. Possible? A request I've seen often here on Experts-Exchange and out on the internet is for the ability to customize the BackColor and ForeColor of a Disabled TextBox. A common complaint is that the text in a disabled TextBox is hard to read because the default forecolor is a gray on top of a light gray background. A good number of these requests are immediately met with fierce opposition to changing the default colors as it might confuse the user since your disabled TextBox will look different from other standard disabled TextBoxes. This article will not take a stand on this issue. Let's assume that you've carefully weighed the drawbacks, or have a valid reason to deviate from the norm, and still want to change the colors of your disabled TextBox. How, then, can we accomplish our goal? Very useful and out of the box ! Thanks! "XMouse" behavior is a system whereby windows receive focus when the mouse enters them, as opposed to requiring the user to physically click on them. Focus is automatically given to a window when the mouse enters it, and stays within for longer than the pre-defined threshold delay. When the window receives focus, it can also optionally be brought to the top of the z-order, in front of all other windows. Why would I want to use XMouse? If you want to create a single file installer using Visual Studio, you can either use InstallShield LE, or repackage your setup.exe and MSI file into a self extracting file. 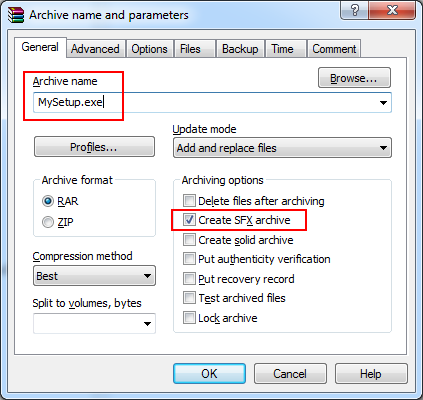 This article explains how to do the latter, with WinRAR, producing a professional looking package. First of all, you may be tempted to just provide the MSI file for the installation. You should only do this if you expect your end users to ensure all .NET runtime requirements are present on the install target machine. This might be adequate in some corporate environments, or for your friends, or for a group of developers, but otherwise Setup.exe bootstrapper should be included with your MSI file. First of all, we’ll look at the steps involved to create the setup interactively. Select the Setup.exe and your MSI file and right click. Select the “Add to Archive…” context menu choice. Now you can edit the archive name, and check the “Create SFX” checkbox. Click the “Advanced Options” tab. Click the “SFX Options” button. This opens a dialog that allows you to change many of the default behaviours of the generated self extract files. 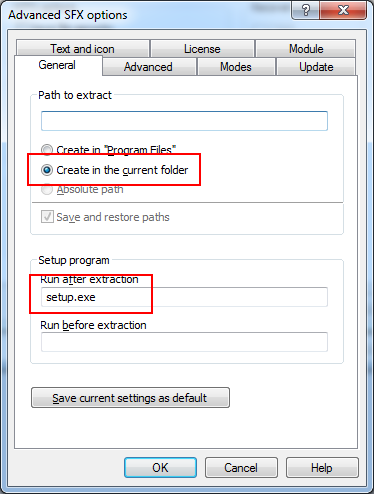 On the General Tab, check “Create in the current folder” and add the option to run Setup.exe after extraction. This will launch your installer when the user runs the self extractor. The XML file provided is by no means a regular XML file, and the code provided in the developer section is PHP. After several days' research and search for simple code to parse the XML file from the ECB, it became clear that there needs to be a simpler way to parse these files. I set out to resolve this by utilising the WebClient Class to download the files and parse them using the XMLTextReader Class. Parsing a CSV file is a task that we are confronted with regularly, and although there are a vast number of means to do this, as a newbie, the field can be confusing and the tools can seem complex. A simple solution to parsing a customized CSV file is to use this function which returns the datatable. You will have to first setup the datatable, and in this simplified scenario, all the fields of the file are imported into the table. (here is a snapshot of the file). And since we intend to load this data into a datatable, here is the setup of the table in code. (You can achieve the same using the designer). Dim pattern As String = ",(?=(?:[^""]*""[^""]*"")*(?! [^""]*""))"
Since the file has a header row, we need to define this and exclude it from the data using LINQ, but firstly, we should declare it as a string constant to later incorporate into the LINQ query. Dim header As String = "Date,Description,FITID,Amount"
At the risk of sounding like I am banging on about the obvious, may I add that aside from the fictitious situation whereby a newbie user forgot to include a closing quotation character on a field that is supposed to be a qualified field because he had no access to a computer, the article does address and provide a solution for parsing of a CSV file using Regex and LINQ. I am sure you agree with that. And last time I checked, there was NO option strict errors with the code, or am I missing something here? Nepaluz, thank you for taking the time and effort to post this. I found it to be very informative and a good alternative to the method I've been using. I do have a follow up question. The CSV files I'm dealing with are huge, in the order of 10's of GigaBytes. Rather than readalllines, can you adapt this function to read one line at a time and return the an array as a data table would be over-kill in this situation. One last thing. Any pointers to a good LINQ tutorial? Creating an analog clock UserControl seems fairly straight forward. It is, after all, essentially just a circle with several lines in it! Two common approaches for rendering an analog clock typically involve either manually calculating points with trigonometric functions, or rotating the entire drawing the surface to draw lines at specific angles. This article will demonstrate just how easy it is to make an analog clock in VB.Net using the latter rotation method. I was surprised by the degree of clarity and logically lucid step by step approach which was used in the article. Why not start a book in the form of teaching by example. A collection of projects that you explain in the manner employed in your article. Just an eBook put on sale at a reasonable price. It's an idea worth thinking about and would really fill a gap in the current flood of books that teach programming. As far as I know there is nothing on the market in this form...! I know we make far too many plans for a holiday like Christmas. We the above in mind, I ask if we are going to see a second part for the analogue clock article...? It’s quite interesting for me as I worked with Excel using vb.net for some time. Here are some topics which I know want to share with others whom this might help. And then extract it and then add Microsoft.Office.Interop.Excel as reference then start writing the things you want to accomplish using .net and Excel. This Blog or Article helps you to write values to excel,Merge Cells,Protect Excel sheet with Passwords and Many more stuffs. .Cells(8, 12).Value ="This is test sentence." 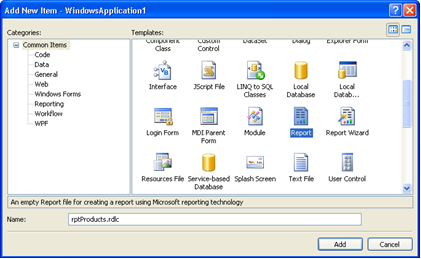 Microsoft Reports are based on a report definition, which is an XML file that describes data and layout for the report, with a different extension. You can create a client-side report definition language (*.rdlc) file with Visual Studio, and build great reports for your applications. Reports may contain tabular, aggregated, and multidimensional data, plus they can include charts, and can be used in WinForm or ASP.NET. 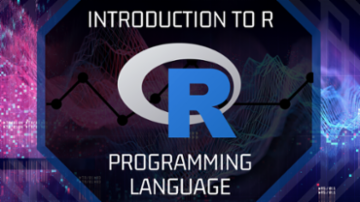 The purpose of this “How To” article is to show the basic steps of creating a report, define the data source at runtime, work with parameters, include images, use the expression editor, and how to feed data to a sub report and chart. Finally it will also demonstrate some easy ways for you to customize the ReportViewer control. To start, I have created an easy SQL table with some data for this example. It's a list of electronic equipment like PDA, Desktop, etc. From that table, you need to create a DataSet with two different DataTables. Just name it “dsReport.xsd”. 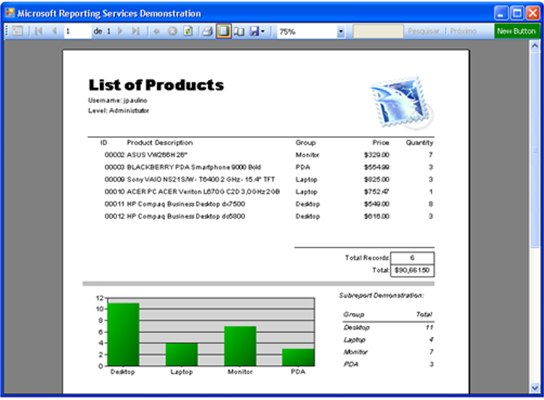 The first DataTable, “products”, contains a list of all of the products in the table. Then the second one, “groupTotal”, is an aggregated (Group By) query with the groups and the sum of quantities that will be used in a sub report, and in a chart. After this, you need to add a report to your application. Just select it and give it an appropriate name. For this example, I have chosen "rptProducts". Converting Visual Basic 6.0 (VB6) to Visual Basic 2008+ (VB.NET). That thinking is wrong! The two are very different languages, with completely different behaviours. In this article I have assumed that the version of the IDE being used is Visual Studio 2008 at a minimum, with V3.0 of the .NET Framework. There are a number of significant differences between the way VB6 and VB.NET work. These differences could create unexpected behaviour in the code if not dealt with. Some of these are outlined in this section. creates an array with 5 elements, from zero to four. The .NET conversion wizard will convert this without complaint. When you explicitly declare the lower bound to be 1, however, the wizard will change the number of elements. and it will add a conversion warning as well so that you are aware of the behaviour. This doesn't compile in either VB6 or VB.NET. In general, I don't think I would recommend people use the conversion wizard at all, except for very limited cases. I guess it could be seen as the start of a rewrite, but most of the COM components and Win API calls used in VBA/VB6 have native counterparts in .NET that are not addressed by the wizard at all. Yes I agree with you. For every problem there is a solution. However, the point of my article was to address those who blindly convert from VB6 to VB.NET, either through lasiness or lack of skill (usually the latter). My aim was to draw these areas to the reader's attension and alert them to possible problems. From here, the reader can go back and visit there code and, if such buffer allocation code exists, they can modify it, either along the lines you suggested, or along their own lines of thought. The points I have raised in my article are ALL from bitter experience. I have had a number of contracts where I was commissioned to come in a fix bad conversions. When many people think of the WebBrowser control, they immediately think of a control which allows the viewing and navigation of web pages. While this is true, it's also very useful for displaying your own custom User Interface (UI). Those members that have used QuickEE will have seen it in action - it is the basis of the Question View pane. 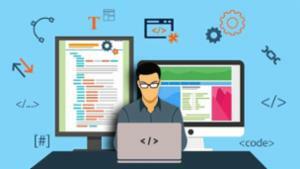 In this article, I will explain how you can raise events from the WebBrowsers DHTML document, and have them handled by your application. For instance, a user might click an HTML <button> object and your application program can then take action to handle that click. The interaction between the DHTML and you application is handled by the Component Object Model (COM), so before you can handle the events you need to ensure the class holding your client code is COM-visible. There are two methods for achieving this. 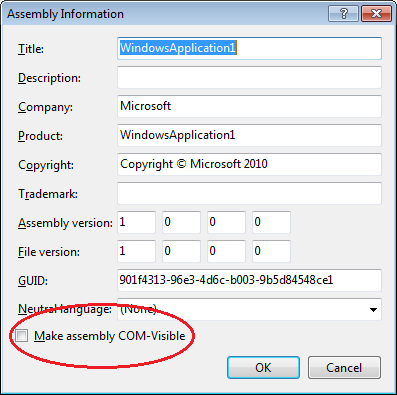 Make either your assembly or a class visble to COM interactions. As chip makers focus on adding processor cores over increasing clock speed, developers need to utilize the features of modern CPUs. One of the ways we can do this is by implementing parallel algorithms in our software. One recent task I needed to perform at home was to find and document large files in certain folders. 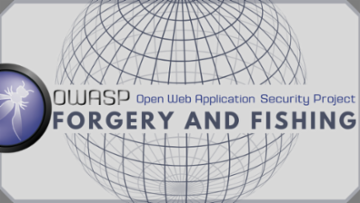 I do a back up regularly of documents and source code, and large binaries in those folders can cause overflow on the media I use for storage. So I wanted a program that could scan through all the files in the folder and build a list of files over a certain size. I thought this would be a good opportunity to use some multithreading and see how the performance was improved. In terms of parallel processing, .NET developers have several choices. BackgroundWorker objects are useful for performing lengthy calculations out of the UI thread so that the UI can remain responsive. You can create your own threads, just by instantiating new Thread objects with delegates to the routines you wish to call. You can also use the built in ThreadPool. If you want an aggressively multithreaded application, the ThreadPool object is ideal. It is designed so that you can queue work items, and as worker threads become available to the pool, the threads will execute the items you queued. It’s convenient as the framework handles the business of queuing and signaling the threads to start. I was able to build and run the project. I got similar timing results. Since .Net 2.0, Visual Basic has made it easy to create a splash screen and set it via the "Splash Screen" drop down in the Project Properties. 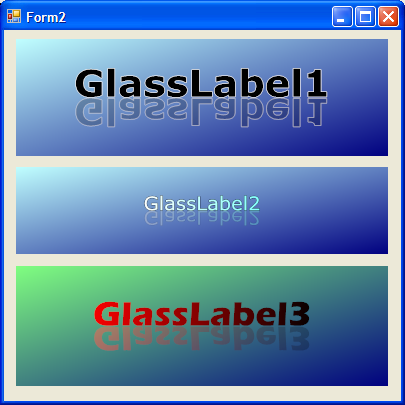 A splash screen set in this manner is automatically created, displayed and closed by the framework itself. The default minimum display time is two seconds, and the splash will stay open longer if necessary until the main form has completely loaded. All of this is well documented on MSDN, commonly known, and discussed pretty extensively in tutorials easily found on the internet. What isn't commonly found, though, are good examples of how to update the splash screen with progress information from the main form as it loads. Many examples and tutorials simply use a static splash screen and leave it at that. MSDN provides an example of how to "update the splash screen with status information" in the MSDN documentation of: My.Application.SplashScreen() property.
' Get the splash screen.
' Display current status information. 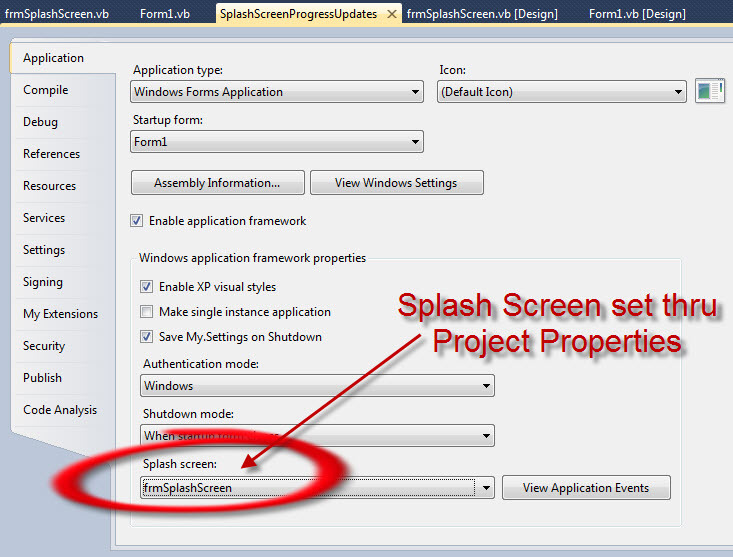 I used the threading example above, but oddly, the SplashScreenPLM form just 'flashed' for an instant then disappeared. To keep things simple, I elected to NOT try using a progress bar with updated message, using instead a static image on the background of my splash form. This works just fine. Thanks all the same, everyone! I'm trying to use your code in windows app. when Login form opend it is not active. What could be done to reslove this isue. Thank you very much, Idle_Mind. hi thanks for your share,, then how could i use it in my form? If you're writing a .NET application to connect to an Access .mdb database and use pre-existing queries that require parameters, you've come to the right place! This query takes a Date parameter that needs to be supplied when the query is run. So if you're writing a program in VB .NET that calls this query you need to somehow provide the parameter also. So to do this you need an OleDBCommand object and then you can add parameters onto your query.
' Add parameters and set values. I think the Typed DataTable and Typed DataSet are very good options when working with data, but I don't like auto-generated code. First, I create an Abstract Class for my DataTables Common Code. This class Inherits from DataTable. Also, it can inherit Typed TableBase(Of T) where T is DataRow or a Typed DataRow. I don't use Typed DataRow. It has worse performance (by about 30%) on Table Fill than DataRow, and also needs some tricks to build it. Next, I create a class for each DataTable that inherits from the base class that contains the common code. In this class, I declare and create each DataColumn for the DataTable. Now I create the class constructor (New) where I add the columns to Table.Columns and optionally, assign PrimaryKey Columns. When I have created each Table, I can create a Class for DataSet (Inherits DataSet). Here, I declare and create an instance for each DataTable. Optionally, I declare and create DataRelations. Then in the Constructor, add each table to DataSet.Tables and relations to DataSet.Relations. When you load a DataTable, DataAdapter or DataReader don't query the database to get column information. You can access Fields by Table.Column declared on Typed DataTable. This is faster than by ColumnName, avoids errors in typing the ColumnName, and has the best support for Refactoring.